Actually, the sleep mode of Windows 10 is what I needed, though I made a mistake previously, I put the pc in sleep mode, disabled the power, enabled the power and then pressed the Power on button, which basically started it up completely, this is why I thought the sleep mode didn't work properly. I hate having to open up all programs and folders again after shutting windows down, this is why I would like to use the hibernate-mode to save energy during the night, but to immediately start working the next morning. Sadly, my current Win 10 Pro installation doesn't have the hibernate option. I tried activating it through the energy settings, but the option isn't available. Anybody has experience with this? 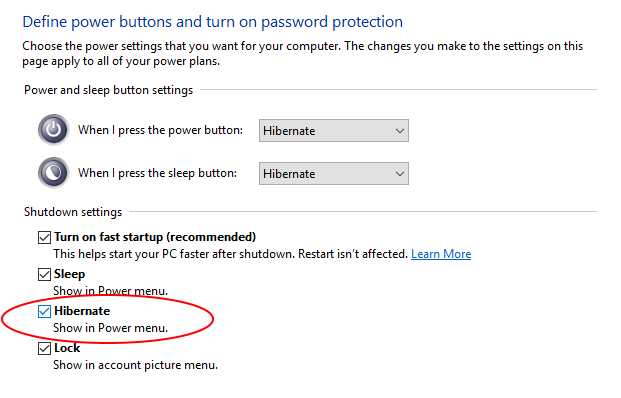 In Windows 10 you can update the power settings to put the computer to sleep via the Control Panel or the Power & Sleep settings, which is effectively the same thing as hibernate. In Cortana type 'Power Settings' in the Ask Me Anything box, and select Edit plan. Then you can set the timing (i.e., on battery put the computer to sleep after 15 minutes). Then click Save Changes and you should be good to go. There are other methods that can be found here. Not the answer you're looking for? Browse other questions tagged windows-10 hibernate or ask your own question. windows 10 desktop - does sleep mode use a lot of energy?